Does it really always rain on conference weekend? Despite historical trends, conferences have yielded little rain since the mid-1990s. When the saints meet, do the heavens really weep? It might have been true historically  prompting a Mormon myth that rain often accompanies General Conference  but the celestial tear ducts appear to be running dry. 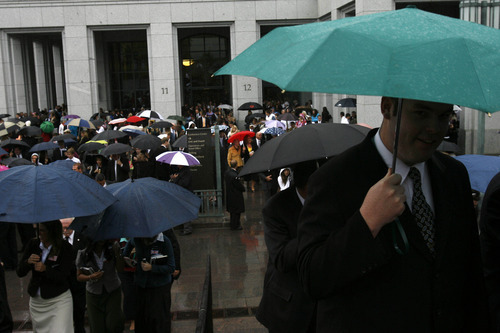 Since the mid-1990s, spring showers have fallen on the LDS Church's April conference a third of the time, according to a Salt Lake Tribune analysis of historical climate data. In fact, five conferences passed without a single, measurable drop. It's a meteorological oddity for the Salt Lake Valley, where Mormons have been dribbled on, and sometimes doused, more often than not during conferences going back to the late 19th century. 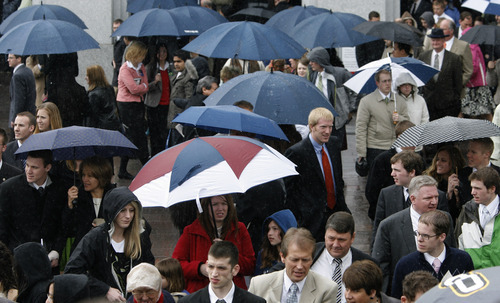 The Utah Center for Climate and Weather reported in 2006 that precipitation had accompanied 64 percent of the church's spring conferences, based on an examination of weather conditions dating to 1888, when the LDS Church began holding its meetings consistently at Salt Lake City's Temple Square. The findings seemed to validate what some Latter-day Saints describe as the "General Conference effect." The study also found that October conferences were notably drier, with rain falling only 42 percent of the time. But spring conferences seem to have encountered a dry spell in recent years. The Tribune found rainfall on only 11 of the 32 conference days since 1995. And nine of the 16 conferences during that period were completely dry. Clayton Brough, a retired climatologist who co-wrote the Utah Center for Climate and Weather's report, says weather conditions could be changing. "It is not surprising at all that as the globe undergoes some climate shifts," he said, "that it will impact the statistics." Conference temperatures, however, haven't ventured far outside the norms since the mid-1990s. No scorchers like 1959, when the high was 82 degrees. And no bone-chillers like 1955, when conferencegoers felt a 20-degree nip. The average high was 55.5 degrees. The average low was 40.3 degrees. • The wettest conference on record was April 3-6, 1921, when 1.19 inches of rain fell during the four-day session. But no single day was wetter than Oct. 10, 1920, when 1.15 inches fell during the fall conference. • The snowiest conference was April 2-6, 1955, when the valley was hit with 12.9 inches of snow. Much of that snow (9.6 inches) fell on the conference's opening day.